My Doll is More Depressed Than Your Doll! Somehow last year, we ended up on the American Girl mailing list. Since that first catalog made its appearance in our mailbox, my daughter has been salivating over the pages, much like I might over a handbag catalog. She’s making her list, since Christmas is near and after looking at the price tag on these dolls, she’s very fortunate her birthday is just a mere 5 days after Christmas. After checking out the catalog, I’m beginning to think the American Girl doll designers are a little depressed and in need of some Prozac laced cappuccinos. Whatever happened to fun loving toys that are supposed to make children happy? These plastic dolls are not only overpriced, but come with stories that would bring a young girl to tears. First there’s Julie, a cute 70’s blonde hippie girl hailing from San Francisco. Her favorite dessert is chocolate fondue and her best friend is Ivy Ling. All sounds happy enough, until you get to the “what changes her life” part – her parent’s divorce and she’s forced to move to a new school! Yet she’s posed with a gap-tooth smile. Shouldn’t she be crying? Maybe her optional $28 tape recorder and record player accessories that actually plays music or the optional $20 pet bunny makes her feel better. They just make me want to cry more. Next we have Molly, who’s living during World War II. And it’s not fun enough that poor Molly has to endure the hardships associated with world war, her dad is sent off to fight in that war. She grows Victory Gardens and helps out with Red Cross fundraisers. She doesn’t have any happy-go-lucky accessories to make her feel better unless you count the locket, beret, purse, and hankie for an additional $24. She does have a friend for an additional $95, Emily, who escaped war-torn London to come stay with Molly’s family. If Molly were around today, at least she’d have a fun military kid summer camp and possibly get to Skype with her dad. If those two little dolls’ stories didn’t tug at your heartstrings, then there’s Kit. She’s described as “a bright light in the dark days of the Great Depression.” That’s a nice little burden to put on a child. The catalog goes on to tell us that many people in Kit’s day couldn’t even afford to buy food or pay their rent and that her dad’s loss of employment is a life changer for her. The bright side is she wakes up each day with a “sunny outlook” in a bed that you can purchase for an additional $80. But then she gets a slap in the face when the dad of her best friend, Ruthie, has to come play bill collector to Kit’s family. Supposedly Ruthie helps protect her friend’s pride somehow, but you have to pay an additional $6.95 for the book that lays that story out. I don’t know about you but if I’m laying out a hundred bucks on a plastic doll, and an additional $100 on accessories then I want a happy story, damn it! I want my doll to be the popular girl in school who makes the cheer squad and dates the big man on campus and who is so intelligent she gets a full ride scholarship to an Ivy League college. And I’m not alone, after reading about the public backlash American Girl faced last year when they released homeless doll, Gwen, and her story of how her dad left her and she had to live in a car with him mom. Needless to say, they don’t sell that “2009 Limited Edition” beauty anymore. 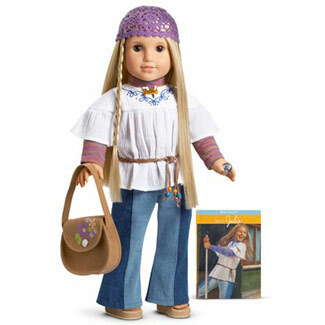 All in all, American Girl has left me feeling like I need a Prozac cappuccino or five, myself. My daughter just gave me her list the other night. She’s picked broken family Julie with an additional Calico dress, heart dress, cozy plaid outfit, honey puppy PJ’s, and the trundle bed complete with bedding (wonder what the thread count on those sheets are) for a whopping grand total of $288. And just try reasoning with a 9 year old girl about how many other things she could have for that amount of money or how sad she’ll be when she leaves it laying on the floor and Julie becomes our dog’s new $300 chew toy. One of us will be crying at the end of December…and it won’t be the dog. ← Please Squeeze the Charmin! Oh my…it sounds like they are trying to sell a doll but pulling at our heartstrings to do it. “Buy this very sad, unfortunate doll and don’t forget to buy her favorite things to make her feel better!” Honestly, what are they thinking with these dolls???!!! It’s not all a fairy tale ending but I don’t want to be guilted into buying a homeless doll and the only toy in the catalog that brings her comfort as well. I’d rather spend money on a new gaming system than all that! And they wonder why kids don’t have any imagination any more! Oh dear, I’ll have to look up Rebecca… and thanks for the tip on Target, gonna have to check that out! funny…I sometimes get those catalogs too….the thing is, some of those dolls look just weirdly creepy. I don’t know if it’s all those horror movies I watched when I was a kid BUT thankfully my youngest is quite content with the cheap store bought baby dolls and I want to keep it that way. I think some of the dolls are creepy looking, too.